So, I love Thanksgiving. Absolutely love it. Some people jump right to Christmas, but I most definitely decorate for Thanksgiving. I love that this holiday is all about being thankful and setting time aside to appreciate what we have. I realize I have so much to be thankful for, but so much of it I often take for granted, don't we all? This year I am especially thankful for all of you, my readers. I'm completely serious, I want you to know that! Here's just a few specific examples of how thankful I have been of all of you lately. 1. Your Comments: I did my very first Facebook live video and was nervous to say the least. I got so many encouraging comments from you all and that meant so much to me! It makes me feel like I wasn't a complete fail even though I stumbled over my words more than a few times. Surprisingly enough, because of your comments, I think I'll continue to do more Facebook videos! 2. Your Feedback: I love checking my phone and reading feedback about how my products help you and your students. This feedback came in today, students asking for more work? WINNING!! 3. Our Relationships: I'm so thankful for the relationships that I have formed with some of you. (You know who you are!) I love getting your emails and comments on Instagram/Facebook. I love hearing what's going on in your classrooms, sharing ideas, and working together. It's the best feeling! 4. Your Pictures: When you share pictures of your students using my products in your classroom, I get warm fuzzies all over! Since I'm not in the classroom this year, seeing those pictures of my products being used by students is a huge motivator for me and helps me remember why I love blogging and TpTing. I'm offering my set of 12 math books at 50% off, valued at $20, regularly discounted for $16, now only $8! 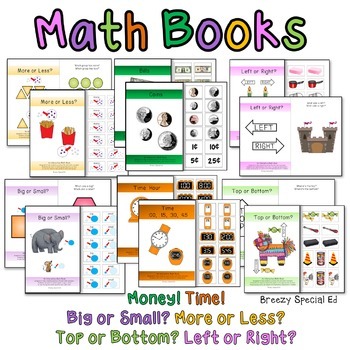 These books are great for extra practice and pair perfectly with my life skill math packs!